Because Naspers has gone up so much in value – largely thanks to its stake in Tencent – Naspers now makes up roughly a quarter of the value of the main South Africa stock index. This has caused a crazy side effect: As Naspers keeps going up in price, fund managers in South Africa have to keep selling the stock so it doesn't get too much weight in their portfolios. Again, the fund managers in South Africa are NOT selling Naspers because it's a bad investment, or because they don't like Tencent. They are selling it because they don't want to hold 25% of their portfolio in one stock. As I write, the market value of Naspers is less than $100 billion. Keep in mind, Naspers owns a stake in Tencent worth roughly $130 billion... AND it owns dozens of other "ecosystem" tech businesses, with full-service platforms that customers never want or need to leave. Clearly, Naspers' stock is trading at a big discount. Naspers will sell off 25% of NewCo in a stock offering. Naspers will retain 75% ownership of the new company. NewCo will own Tencent, plus Naspers' other ecosystem-type tech businesses. And it will instantly become Europe's largest consumer Internet company. Much of the discount due to the South Africa listing can finally disappear. That means NewCo's valuation won't have a ceiling anymore. And Tencent is that much closer to becoming the world's largest company. If you followed my advice to buy into Naspers, you are in a good place... So thank you for sticking with me and buying this little-known name. I believe NewCo shares could ultimately trade at a premium to the company's stake in Tencent. And Naspers' tech businesses are a perfect way to profit in my Melt Up scenario, if tech stocks soar the way I expect during the final innings of this bull market. P.S. I've covered Naspers in my True Wealth advisory for years... It's where I share the contrarian investment ideas that most folks overlook completely. I'm watching this story closely – and as it unfolds, I'll follow up with more specific advice for my paid subscribers. To learn how you can sign up for True Wealth today, click here. "Most folks in the U.S. don't want to hear this... But it's simply unwise to ignore China in the years to come," Steve writes. Right now, a shift is taking place in one corner of the Chinese market... one with big investment implications. Get the full story here. "Solving this problem will shift up to a trillion dollars into Chinese stocks in the coming years," Steve says. Read more about another reason he's bullish on China right here: The '4-2-1 Problem' and What It Means for Investors. 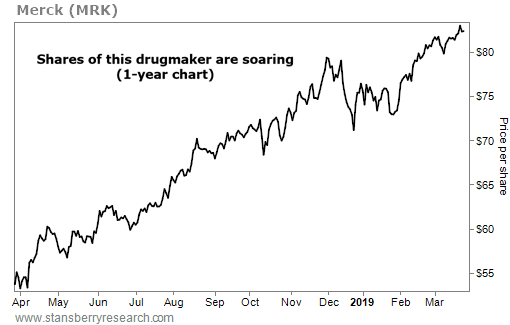 Merck (MRK) is a $210 billion pharmaceutical giant. The company makes lifesaving drugs like Januvia, Keytruda, and Zetia… all of which help fight common conditions in seniors (diabetes, cancer, and high cholesterol, respectively). Merck also makes vaccines for diseases like measles, mumps, and shingles. Providing medical treatment is big business these days… In 2018, Merck reported sales of more than $42 billion, the highest since 2013.